BRUSSELS (AP) — The top suspect in last year's Paris attacks told investigators after he was captured that he was planning new operations from Brussels and possibly had access to several weapons, Belgium's foreign minister said Sunday. Salah Abdeslam had claimed that "he was ready to restart something from Brussels, and it's maybe the reality," Foreign Minister Didier Reynders said. Reynders gave credence to the suspect's claim because "we found a lot of weapons, heavy weapons in the first investigations, and we have seen a new network of people around him in Brussels." 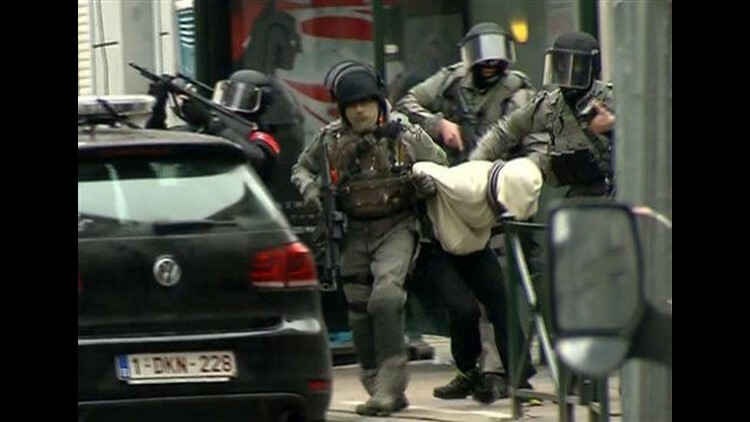 Abdeslam, captured Friday in a police raid in Brussels, was charged Saturday with "terrorist murder" by Belgian authorities. He is a top suspect in the Nov. 13 attacks in Paris that left 130 people dead. Abdeslam was wounded during the raid, and a senior Belgian police official said that he was shot in the leg as he ran toward officers outside an apartment in the Molenbeek neighborhood. The head of Belgium's special federal police unit, Roland Pacolet, told broadcaster RTL that one hypothesis being studied by police was that the suspect wanted to commit suicide. "When someone comes out running toward the police, we have to ask ourselves some questions. What did he have in mind? What was he going to do? Either he wanted to get killed by the police, or he wanted to blow himself up near the police," Pacolet said. He said that Abdeslam was unarmed. Speaking to security experts at a German Marshall Fund conference in Brussels, the foreign minister said "we have found more than 30 people involved in the terrorist attacks in Paris, but we are sure that there are others." Reynders urged European intelligence, law enforcement, and border authorities to exchange more information to help track the suspects down. Abdeslam's Belgian lawyer, meanwhile, threatened to launch legal action Monday against a French prosecutor, accusing him of breaching the confidentiality of the investigation into the deadly rampage in Paris. Sven Mary told Belgian public broadcaster RTBF that part of the press conference given on Saturday by Paris prosecutor Francois Molins "is a violation. It's a fault, and I cannot let it go unchallenged." Molins said Abdeslam, 26, told Belgian officials he had "wanted to blow himself up at the Stade de France" as a suicide bomber, but that he backed out at the last minute. France is seeking Abdeslam's extradition for trial there, but Mary said he would fight any attempt to hand over his client and that investigators have much to learn from the suspect, who was born in Belgium but has French and Moroccan nationality. "Salah is of great importance to this investigation. I would even say that he is worth gold. He is cooperating, he is communicating, he is not insisting on his right to silence. I think it would be worthwhile now to give things a bit of time ... for investigators to be able to talk to him," Mary said. In response, an official in the Paris prosecutor's office said French law allows prosecutors to speak about elements of an investigation. The official spoke on condition of anonymity because they were not allowed to discuss this issue publicly. Belgian Justice Minister Koen Geens was cautious about how the legal proceedings will unfold against the suspect, but said the kind of extradition procedure being used would limit the possibilities for Abdeslam to appeal. "It could take two months, two and a half months, and we will not be certain of the result before then," Geens said on RTL television. The next official step in the legal process comes Wednesday when Abdeslam faces court in Brussels. The suspect, who could be one of the rare jihadis to face trial and possibly speak during proceedings, awoke Sunday after his first night in a prison just outside the city of Bruges, western Belgium. The prison has a special section for high-profile prisoners, with specially trained guards. Cells have double doors and any furniture or equipment is attached to the floor. Abdeslam was shot in the leg Friday along with a suspected accomplice when they were captured during an anti-terror raid in Brussels. He was found at an apartment a mere 500 meters (yards) from his parents' home, where he grew up. Mike Corder in Brussels, and Angela Charlton in Paris, contributed to this report.